What do children’s writers and illustrators read in their spare time? In this series of interviews with B.C. book folks, we discuss everything from guilty reading pleasures to the best literary villains. If you’d like to share some favourites of your own, please leave a comment! Where is the best place to curl up with a good book? I read anywhere and everywhere, but reading in bed at night is a must. 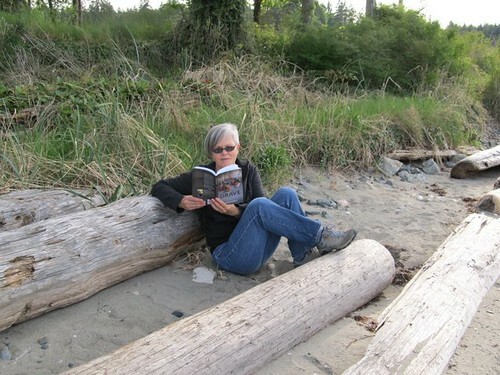 My absolute favourite spot to read though is on Rathtrevor Beach on Vancouver Island. What books are on your end table right now? Janet Gurtler’s If I Tell, Mathew Hooton’s Deloume Road, Suzanne Desrochers Bride of New France, Susan Juby’s Nice Recovery, Budge Wilson’s Before Green Gables, and Sophie Kinsella’s I’ve Got Your Number. What series did you read growing up? As a kid, I read fairytales, then moved on to Nancy Drew, the Hardy Boys and the Black Stallion series. As a teen I read adult fiction since YA didn’t exist back then. Some favourites were Daphne Du Maurier’s Rebecca, John Updike’s Couples and John Fowles’s The Magus. I also read all the banned books like Fanny Hill and Lady Chatterly’s Lover that were hidden under the desk at the library where I worked after school. Who’s your favourite literary hero? I really like strong female characters and it’s hard to pick just one, so I’ll say Katniss Everdeen, Hermione Granger, and Lisbeth Salander. I have no guilt, ever, about what I’m reading, although sometimes I feel guilty reading when I should be doing something else, like cooking or cleaning. But for sure there are books I feel I should read, and those I actually want to read. So I usually read some of the serious literary stuff first, then at bedtime switch to something light — chicklit, women’s fiction, or funny, contemporary YA. To learn more about Jocelyn and her books, please visit her website. This entry was posted in just for fun, What Writers/Illustrators Read and tagged Jocelyn Shipley. Bookmark the permalink. I love to read outside, under a tree, by a lake, on my deck. Or inside on the lazy boy in my bedroom. Or in bed. Or on a plane, or in an airport. A good book is makes everywhere a good place. I agree, Sylvia. A good book is the most important thing.